Obviously not all pug adoptions work out. Fortunately, Pug Rescue is a way to come to the aid of an owner who needs to get rid of his dog and the Pug who needs a new home. Pugs are not immune to the possibility of finding itself homeless. 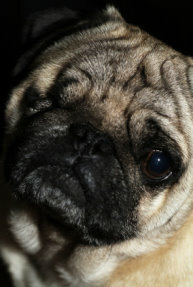 Even worse, Pugs can be injured or abused and have to be removed from the situation they’re in. Dogs who have been in an abusive situation need special care. Any dog coming into a new situation needs at least six months to completely adapt to their new surroundings, new owners and the new routines that they are being exposed to. Keep in mind that, if they have been abused, they will have a great deal of fear that will need to be overcome. If your Pug seems to be afraid to do something or go somewhere there is probably a good reason. You will need to be extra patient. Keep training sessions short. You will need to undo a lot of damage. Patience, gentleness and a lot of love are required here. If that sounds like something you would like, a Pug rescue may be exactly the way you might want to bring a Pug into your home. It is double rewarding. You are doing a wonderful thing for the dog and you will feel very good about your self. You should – because it’s a great thing to do. Volunteers throughout the world give of their time and resources to come to the aid of this very cute breed. Some of these people are breeders, some are owners and some are just nice people who want to do a good deed. Many times there is a good reason for an owner to get rid of their dog. A life change such as moving or illness can necessitate an owner having to get rid of their companion. Many times it is a very sad time for the owner and they are very happy that organizations exist that can come to their aide. Sadly, there are also times when Pugs are in abusive situations. This can happen with a dog breeder who is just out for the money and has created an unsanitary condition for the animals. They can be closed down by the local officials but the dogs have to go somewhere. Some Pugs run away and get injured and end up being taken in somewhere. Thankfully there is a place to go. How to find a Pug Rescue organization.